Does Freeform still have amour for their Famous In Love TV show? The series recently completed its second season and there have been reports that the show has been cancelled. However, the series’ showrunner and cable channel contend that a third season renewal is still possible. A Freeform TV series adaptation of the Rebecca Serle novel, Famous In Love stars Bella Thorne, Carter Jenkins, Charlie DePew, Georgie Flores, Niki Koss, Pepi Sonuga, Keith Powers, and Perrey Reeves. The action centers on Paige Townsen (Thorne). Upon landing a role in the Hollywood blockbuster, Locked, Paige must acclimate herself to fame and all it entails. The first season of Famous In Love attracted a mediocre 0.14 rating in the 18-49 demographic with 331,000 viewers. The series was renewed for a second season a couple months after the finale aired. Season two dropped about 25% in the ratings when compared to the first season, averaging a 0.10 demo with 254,000 viewers. The finale aired May 30th. THR reports that Famous In Love has been cancelled by Freeform. The cable channel reportedly wanted to do a third season of series but had to ask Hulu (which has the streaming rights) to increase their contribution. According to the report, Hulu has yet to receive an official proposal so it’s unclear how this has caused the cancellation. The report also notes that the cancellation is considered a relief for some involved in the production of the show. Thorne and showrunner I. Marlene King supposedly clashed on multiple occasions with the actress exhibiting “diva-like” behavior. THR also notes that Thorne refused to take part in Freeform-organized live-tweets for season two and she reportedly wanted off the show. King has since responded to the report via Twitter. 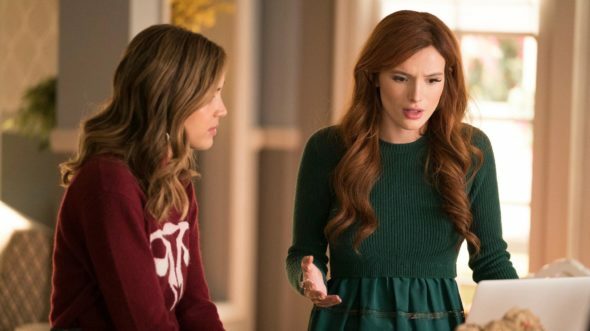 While she hasn’t directly disputed that Famous in Love has been cancelled, she does say that the entire cast is hoping for a third season pickup and that she and Thorne have a positive relationship. Thorne later retweeted the relationship statement. Officially, Freeform says that a decision on season three has not been made yet. What do you think? Do you like the Famous In Love TV show? Do you think it has been cancelled? Is season three still possible? More about: Famous in Love, Famous in Love: canceled or renewed?, Famous In Love: ratings, Freeform TV shows: canceled or renewed? It finally cancelled I knew it long time season end good sad say apart. Famous In Love needs to come back for a third season!